‘Without understanding its cultural capital, Polish cuisine will remain anonymous’. So, how do we make foodies from other countries fall in love with Polish cuisine? Professor Fabio Parasecoli explains all to Culture.pl’s Magdalena Kasprzyk-Chevriaux. Fabio Parasecoli – culinary writer, editor of multi-volume analysis A Cultural History of Food, long-time associate of the Italian magazine Gambero Rosso and Professor of Food Studies at New York University. His research encompasses the connections between food, culture, politics and design. He is the author of the books Feasting Our Eyes: Food, Film and Cultural Citizenship in the US (2016, with Laura Lindenfeld) and Knowing Where It Comes From: Labelling Traditional Foods to Compete in a Global Market (2017). Magdalena Kasprzyk-Chevriaux: For the last two years, you’ve often come to Poland. What’s caught your interest here? Fabio Parasecoli: As a culinary scholar and writer, I’m interested in the globally increasing interest in food and the sources of this interest. There’s been a lot changing in Poland as well. Observing this phenomenon is extremely inspiring. I can see dynamics similar to what I remember from Italy 30 years ago. MKC: In an interview I conducted with you some time ago for the cultural and culinary magazine Usta, you said that you see Polish cuisine’s potential to become more recognisable thanks to its history, tradition and unique products and techniques. Let’s begin this way: what is Polish cuisine for you? FP: The history of Poland (similarly to Italy) is so complicated that I doubt a uniform national cuisine could exist there. Instead of unsuccessfully trying to define what it should be, I’d rather speak of the modern approach to different cuisines and traditions present in Poland. This is a more accurate approach, tied to the economy and various values. For similar reasons, I called one of my books The History of Food in Italy and not 'The History of Italian Food'. Nowadays, the attempts to define ‘national’ cuisines are outdated. MKC: What interesting products have you discovered in Poland? What inspired you? FP: First of all, the nalewkas. Before my visits, I had no idea that something like this existed. I tried many different ones and last year, during the Festival of Taste in Gruczno, I was part of a tasting panel and met experts of nalewka-making, such as Zbigniew Sierszuła or Karol Majewski. The underground idea of preparing homemade alcohol is very appealing to me. Not only for its slightly illegal character, but also because the preparation of nalewkas requires the use of the very varied gifts of nature. Secondly, I am interested in the still-practised forest gathering and the still-popular mushroom picking. It is amazing that so many Poles still cultivate this tradition. Last year, I was riding in a car with somebody who was able to spot a penny bun from a moving vehicle! They had to stop the car and pick the mushroom. This is a living tradition. Everybody knows somebody who still goes mushroom picking. FP: This is another marvellous characteristic of Polish cuisine. On the one hand, there is the tradition: sauerkraut and pickled cucumbers. 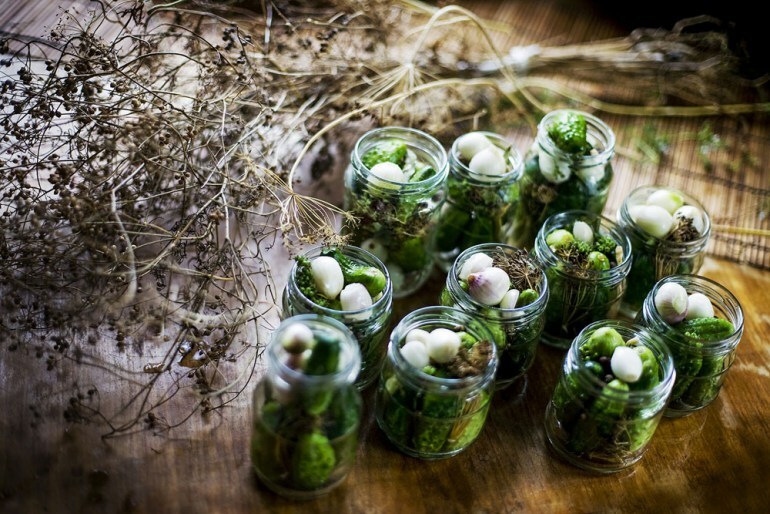 On the other, the trend of the modern way of pickling. You can see it in the examples of some chefs who are fascinated with the process of fermentation, such as Aleksander Baron. Fermentation is also popular in other parts of the world and it can be used to stress the connections between Polish cuisine and global trends. MKC: In Wysowa Zdrój in Southern Poland, they promote pickled saffron milk cups. At Stary Dom Zdrojowy there, you can eat a soup made of them. Is there anything apart from pickling that caught your interest? FP: It’s also worth pointing out a local trend, one for goose or duck meat. Last year I visited Kujawy and Lubraniec where they have a festiwal of czernina [editor’s note: a soup made of goose blood]. 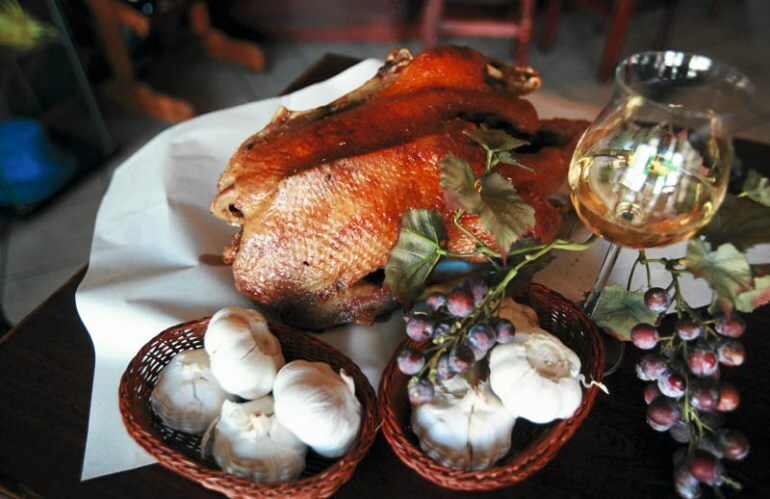 The housewives prepared not only soup but also many other dishes made of ducks and geese. I like the way they use the entire bird. Also, you have a lot of fish products, especially smoked. One time, I visited Stawy Milickie and was surprised how well the centuries-old tradition of fish-breeding is cultivated there. There’s also the phenomenal Ojców trout. MKC: You received a grant to study Polish culinary traditions. Could you say something more about it? FP: It’s from the Polish National Science Centre. The money was granted for three years and the research project will be rather deep and multithreaded. Because I’ve only started to learn Polish, I work with a Polish scientist – Mateusz Halawa from the Institute of Philosophy and Sociology of the Polish Academy of Sciences. MKC: What is the aim of this research project? FP: The idea was born around a year and a half ago, when, thanks to my trips to Poland, I discovered the growing interest towards traditional, local and regional food. We want to analyse the reasons for this phenomenon: where did this interest come from and why now? Who are the major players in the market? What are the relationships between the consumers, producers and cultural mediators? To what extent can the interest in traditional food expand from a small group of foodies (who are prepared to spend a bit more on food) to the general public? We want to see if this interest in traditional food is a result of the Polish fascination with foreign cuisines, which used to be an expression of their feelings of affiliation with the cosmopolitan world. MKC: Today, in the context of tradition, food is discovered anew in different parts of the world. It’s a global trend. FP: Yes. Last year I wrote a book called Knowing Where It Comes From, in which I deal with this. After the globalisation period of the 1980s and the 1990s, people around the world became interested in food by discovering forgotten products. It’s started to happen in Poland as well. We want to understand the process and its causes and answer the question of what the cultural experience associated with it is, who’s involved, in what way do people speak of traditions and regional food, what importance does it have in the context of producers, and how does it influence the offerings of supermarkets. We are also interested in the design aspect, practices and customs associated with such food. We’ll study ways of consuming and connections with suppliers. MKC: What will the final outcome be? FP: A series of academic articles and a book published in English in an international publishing house. MKC: During Terroir Warsaw, an international event involving Polish and foreign chefs which took place on 27th and 28th of May in Warsaw, there was talk of whether Poland could be a culinary paradise for tourists and a new, hot place for trendsetters to discover original tastes and products. How do you evaluate our potential in the context of international culinary tourism? FP: There is potential and many unique products that could interest foreign foodies. But I see two issues in relation to Poland that would have to be looked at and solved. The first one involves infrastructure. You have amazing craft producers, but are they ready to accept guests? Are there guesthouses where the tourists could stay, are there tasting rooms in the vineyard, are there co-ordinators that could help the foreign tourist prepare their own travel plan? The role of such experts is extremely important, because people interested in culinary tourism do not usually pick large traditional agencies. On the contrary. They want to experience something intimate and unique and that’s why they inquire at companies that organise trips for groups of just a couple of people. Having a business network and working with the producers is indispensable here. MKC: And the second issue? FP: Transparency and communication. You need to talk about Polish cuisine in a way that would make sense for foodies from other countries. That’s why so-called cultural mediators are needed – people who not only have a great deal of knowledge about the culinary scene in Poland, but who also speak a language that is understandable to foodies. The way culinary services are presented in social media, movies and books is important. MKC: Have you observed important changes in our culinary scene since your first visit to Poland? FP: I could mention the growing interest in natural wines. A distributor I know told me that in the last year alone, the sales of such wines have tripled. I like the idea of collaborating in various culinary projects. For example: the Resto Bar Ogień in Pogorzany in Lesser Poland. Chefs from all around Poland head there. Together, they invent a menu and cook using products available on that day. This co-operation takes place in a very democratic way. I also have to mention the idea of returning to old culinary techniques. In Resto Bar Ogień, which I visited recently, everything is cooked or roasted over an open fire. The relationship between cooks and scientists working on the history of cuisine, such as Professor Jarosław Dumanowski, are also very interesting. Many chefs are fascinated by old Polish cuisine and draw inspiration from it during the preparation of their own modern dishes. It’s an important phenomenon, but I haven’t studied its scope yet. Another novelty worth mentioning is the so-called idea of food sovereignty, which says that local communities have the right to decide what to grow and how to do it. This involves the rediscovery of biodiversity thanks to the return to old varieties of local seeds, plants, vegetables and fruits and to the attempts to recreate, even partially, the local nutrition system. I noticed other trends even earlier, such as the interest in regional and traditional food. It’s becoming more visible now, because such products are more and more discussed and are beginning to appear on restaurant menus. I’d like to stress the successes of various food and taste festivals, during which there are discussions held about food: the European Festival of Taste in Lublin, the Festival of Taste in Poznań, or the Festival of Taste in Gruczno. This example shows how the interest in the local food transfers to the broader public, because every visitor can engage in direct contact with a producer. MKC: What advice would you give the Polish gastronomy to become more noticeable abroad? FP: The chefs and cooks won’t do much without the producers, distributors, media and people who consider food a part of culture. Without understanding its cultural capital, Polish cuisine will remain anonymous, even though many chefs have worked abroad and now run their own world-class restaurants that are not written about abroad. Thankfully, for the last few years, you have had the bilingual (Polish-English) Gault & Millau guide for Poland, but there remains a lot of work to be done.